After the Big Deep (GROB102), Warp Out is the second album from KONK PACK, the all-star trio of Thomas Lehn, Tim Hodgkinson and Roger Turner. We had already noted when we announced Big Deep that KONK PACK was a working band that has regularly toured since the end of 1998 and is very interested in continuously working together. The musical approach, therefore, bursts apart a narrow conceptual understanding of improvised music. The band has a dense and supremely well handled communicational repertoire, which allow them to infiltrate the fields of rock music without ever sounding like rock (even when they allow Captain Beefheart's Magic Band-in its most unchained moments-to serve as a reference for a few passages). They bring the intensity of noise music to its essence, and yet they are, first of all, an improvising, free playing or, better, liberated acting band. Freedom for them is not only freedom from rhythmical and harmonic clichés, it is also a freedom to decide for specific idioms. Plainly, KONK PACK do not plan to vouch again for new clichés once the old ones have been smashed apart. Warp Out is not a noise album! The searching and finding, the quiet passages in which the energy has first to be collected, the sound organization without hierarchy-all are elements that stand, with equality, next to the orgies of intensity. Moreover, these elements give the latter a depth and sharpness it would not have without the contrast that the restrained moments give the music. Warp Out is also a premiere. Big Deep was a compilation of various live recordings. The new album is a pure studio album, recorded on June 23 and 24, 2001 in the sound studios of the Cinema and Television College Potsdam-Babelsberg. 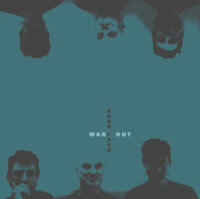 Warp Out is a fundamental statement from one of the most interesting groups of this day.